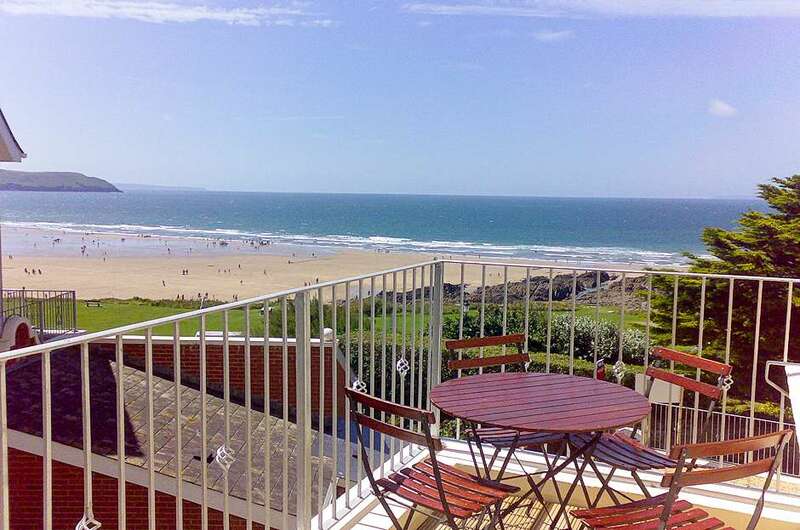 This lovely 1st floor 2 bedroom apartment is in a fantastic location just minutes to the main beach at Woolacombe. Belmont Court is the first property on the right up Rockfield Road from Woolacombe’s famous Esplanade, its all about the location and proximity to the beach here. The best of the stunning view can be appreciated from the living room and its large private balcony with cafe table and 4 chairs. This is off the living room which has a brown leather corner sofa, dining table with 6 chairs, flat screen TV with DVD,PS2 and WiFi. The separate kitchen is fully equipped with dish washer, washing machine, fridge freezer, microwave, oven hob etc and small table with 2 stools for breakfast with a view! The gorgeous double bedroom is en-suite, has a Juliet balcony with view through buildings towards Potters Hill and a TV. Bedroom 2 has sturdy bunk beds and a single bed with storage under. It also has a tallboy wardrobe with hanging and shelves and bedside drawers. In the apartment there is a family bathroom with mixer shower attachment. Outside there is a private storage shed for wetsuits/boards and beach paraphernalia and even a cold water communal outdoor shower for after the beach! Allocated parking space strictly for 1 car. A £100 security deposit is held and released after the holiday.